2. Which algorithm is used to create a loop free switched topology? 3. What is meant by "five nines" network uptime? A network should be available until 9:00 pm five days of the week. A network should be functioning 99.999% of the time. There should be five nine-port uplinks for each backbone segment. Five percent of network expenditures should address 99% of user requirements. Nothing short of 100% network uptime is acceptable in modern networks. Switch_A and Switch_B shown in the graphic receive an ARP request from the host and forward it out their ports. The switches receive the forwarded requests from each other and in turn flood the requests again. What will be the result if this process continues? 6. How often are BPDUs sent by default in a network using the spanning-tree algorithm? User traffic is disrupted until recalculation is complete. The switch recomputes the Spanning Tree topology after the network converges. All ports are placed in learning state until convergence has occurred. A delay of up to 50 seconds is incurred for convergence of the new Spanning Tree topology. User data is forwarded while BPDUs are exchanged to recompute the topology. 8. How can a network administrator influence which STP switch becomes the root bridge? Configure the switch as the static root bridge. Change the BPDU to a higher value than that of the other switches in the network. 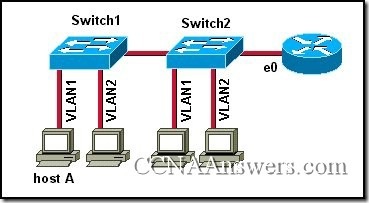 Set the switch priority to a higher value than that of the other switches in the network. 10. 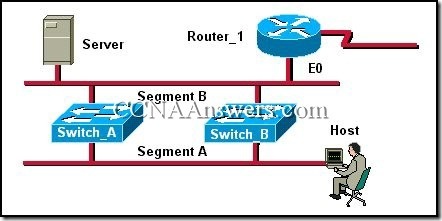 How does a switch forward a multicast frame through the network? It floods it to all ports as a broadcast. It is forwarded only to ports that contain the destination address. It is sent to the port that contains the first destination address. It floods it to all ports except the one it was received on. It is dropped and not sent to any address. 11. Following a link failure, when does Rapid Spanning Tree Protocol allow point-to-point and edge type links to go to the forwarding state? 12. 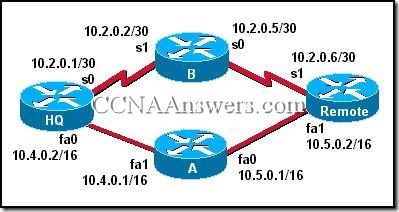 What is the first step in the process of convergence in a spanning tree topology? 14. What characteristic of Ethernet makes a redundantly switched network prone to loops? Routers are only able to prevent loops at Layer 3, while Ethernet exists at Layer 2. The Ethernet protocol has no TTL mechanism. Switches lack the sophisticated software required to prevent loops. Looping of frames is a reliability mechanism built in to the Ethernet protocol. 15. In which STP state does a switch port transmit user data and learn MAC addresses? 16. In which STP state does a port record MAC addresses but not forward user data? Refer to the network shown in the graphic. Host1 needs to transfer data to host2, but host1 has no MAC address entry in its ARP cache for host2. What will happen on the network as host1 prepares to transmit its data to host2? Host1 will receive an ICMP destination unknown message from switch3. All hosts in the network shown will receive an ARP request message from host1. Multicasting will occur until host2 is located. 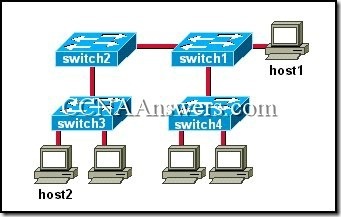 Switch3 will send the host2 MAC address from its bridging table to host1. A broadcast storm will occur. 20. How much time does it take for a switch port to go from the blocking state to the forwarding state? Refer to the graphic. Server sends an ARP request for the MAC address of its default gateway. If STP is not enabled, what will be the result of this ARP request? Router_1 will kill the broadcast and reply with the MAC address of the next hop router. 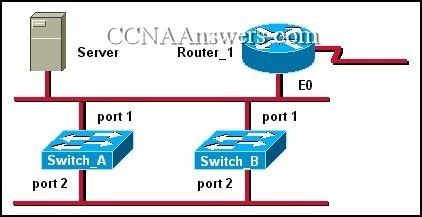 Switch_B will broadcast the request and reply with the Router_1 address.